I used to feel completely clueless when making my boys lunch boxes. – they would come home with most of it uneaten or just nibbled on. When I asked my big boy why he hadn't finished or touched his food, he exclaimed that he hadn't had the time in first break and in second break he got too busy doing this or that. And the stories just kept piling on. Another good excuse would be that they didn't feel like such and such on that day. And to be honest I don't feel like some things every now and then so I totally get that they might not be in the mood for what I've prepared on that particular day. But it was so important to me to know that they were getting the right fuel because they get so worn out in kindy/school and while learning and playing, it's such a long day for their little, growing bodies. So I figured if I wanted to fix both problems I had to come up with something different. I know they are busy little creatures so they need something that is easy to eat and pick at even when they are in a deep conversation with their best school mate or if they are in the middle of a bay blade school yard battle. I started making a little bit of everything in their lunchboxes. Small portioned snack-sized meals served as finger foods which are easy to grab and get energy from. This could include all sort of fruit, cut up veggies, rice crackers, homemade oat balls, cheese sticks, yoghurt and sultanas. To solve the problem of the kids not feeling like this or that I have started giving them options for their sandwiches or main meal parts of their lunch boxes. 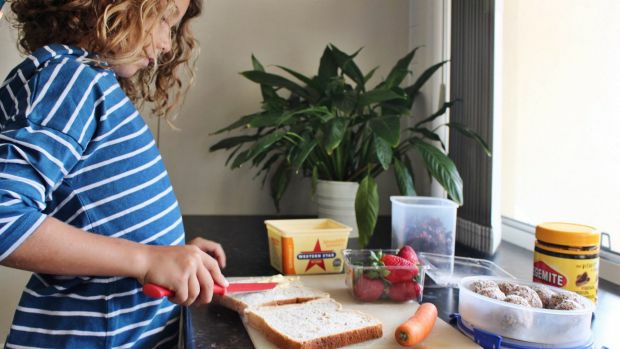 Giving the boys a choice between a few options often makes them feel a bit more in control and they recognise their choice when they open their lunchboxes the day after. In addition to that a great trick (and that's if you have the time and patience as it can get quite messy) is to involve the kids in the lunch box making. So again, let them choose between a few healthy options and encourage them to make their own sandwich. They feel so proud when they open their lunch box and pull out a great big vegemite sandwich they made all on their own! The one thing I've learned from years of lunch box making for my boys is that small portion sizes are so much better for them to deal with – rather a bit less of something and just a few more options instead. Making it a bit more bearable for them to deal with rather than having to concur a mountain of carrots.